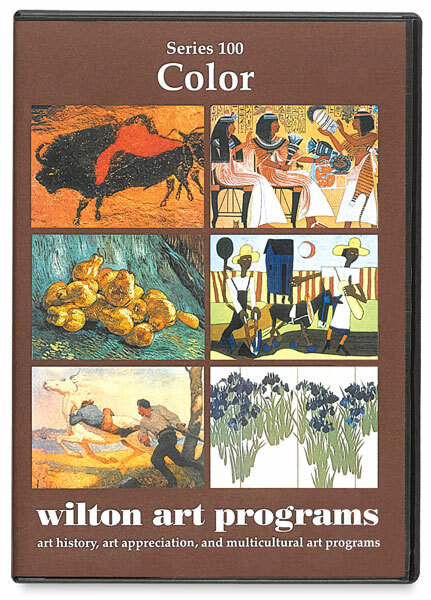 This is an enhanced version of the popular Wilton Art Appreciation Series 100 program, specifically developed for very young students. It introduces elements of art and then applies visual concepts in journeys through great works of art. Narration is simple, direct, and stimulating, while graphic illustration and animation make it enjoyable. It is designed to solicit student response and participation. It's also brilliantly photographed and easy to follow. An informative teacher's guide includes suggested activities and a vocabulary list. The DVDs were created in still-frame format. Each DVD also contains interesting short stories about the artists and photographic images from around the world, designed to connect with the lessons. DVDs run 28 minutes, and each one contains 2 lessons. DVD 2: Elements of Art — This video explains lessons on line, shape, form, texture, pattern, and balance. DVD 1: Color — This video explains primary and secondary colors, complementary and neutral colors, warm and cool colors, and so forth.